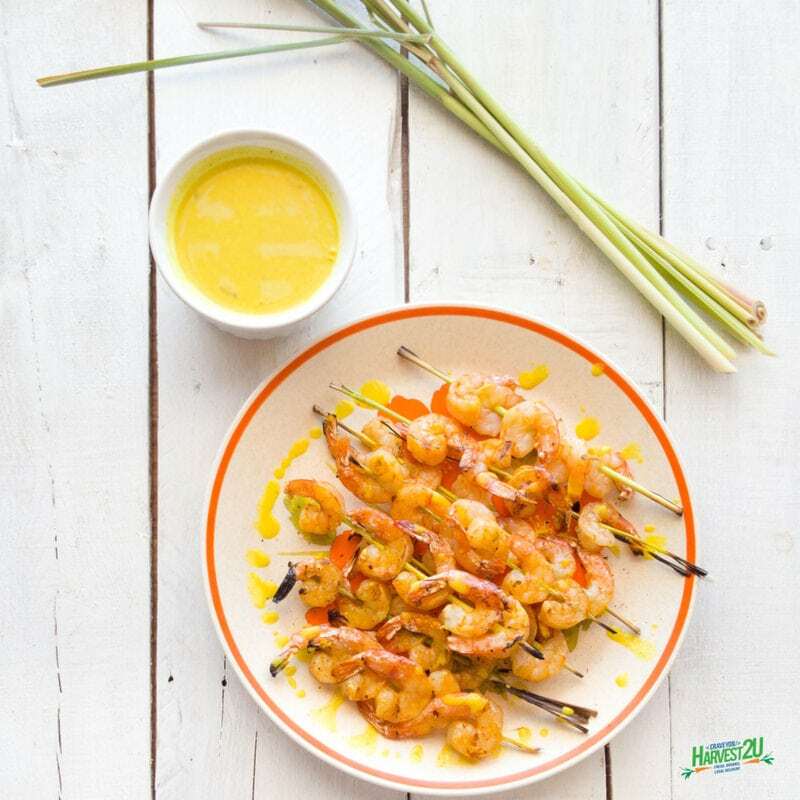 This Grilled Lemongrass Shrimp Skewers recipe make full use of most of the lemongrass, using it in the marinade and as the actual skewers for the shrimp. Lemongrass is a delightful herb with an herbal lemony taste. Have you smelled citronella candles or essential oil? That is what it tastes like and because citronella comes from the lemongrass plant. Lemongrass has many uses. It is used for treating stomachache, digestive tract spasms, convulsions, high blood pressure, pain, cough, vomiting, achy joints (rheumatism), the common cold, fever, and exhaustion. It is also used as a mild astringent and to kill germs. This Grilled Lemongrass recipe also adds a little turmeric which is excellent for joint health and gives this a characteristic mustard yellow color. Remove most of the shell from the shrimp leaving the tail on. Trim the leaves off of the lemongrass and save for stock or brew into a tea, if desired. Trim 4-6 inches off the bottom white part of the lemongrass. Save 4 for use in another recipe. Split the woody green parts of the lemongrass in half lengthwise to make skewers. Chop the white piece of lemongrass into a few pieces. Use a mortar and pestle to pound the lemongrass and garlic to make a paste. In a medium bowl, combine lemongrass garlic paste, turmeric, sambal oelek and coconut milk. Or throw all of the ingredients into a food processor and blend until the garlic and lemongrass are finely minced. Add half of the marinade to the shrimp and let marinate for 30 minutes. Pour the other half into a saucepan. While grill is heating, heat the reserved half of the coconut milk mixture. If you want a thicker dipping sauce: mix a teaspoon of cornstarch mixed with a tablespoon of water, whisk into the sauce and cook over medium until thickened. Skewer 6-7 shrimp on each of the lemongrass skewers, leaving a little room between them. I found it easier to start with the top woodier part. Grill the shrimp for 3-4 minutes a side.